It’s Tuesday so you know what that means right? It means that damn whimpy owes me for that burger I gave him. 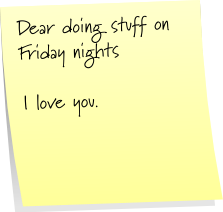 Or you know Post it Note Tuesday. Make your own here. This week it’s love themed because of Valentine’s day. I work Friday nights (museum stays open till 9) it’s pretty set. I’ve missed lots of art openings and theatre stuff because of it. Don’t even get me started on the fun I’ve missed with the wifebot and or friends. I’ve decided money be damned to be better at taking nights off to really enjoy things. Valentine’s Day I took off and we went to The Stupid Cupid show at Doubting Thomas. It was fun and then we headed for dinner at El Carnicero. Speaking of El Carnicero: It is delish. We shared among other things the machaca: coffee + ancho braised beef brisket. 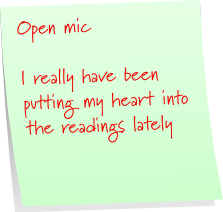 I’ve done the open mic at Loganberry books for two straight months. It’s growing and I’m getting better (THAT’S WHAT SHE SAID) If in the Cleveland area check it out. 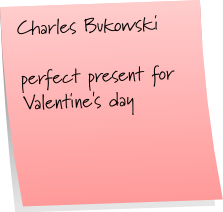 The wifebot bought me a Bone Palace Ballet by Charles Bukowski for Valentine’s Day. Where? The awesome Loganberry books of course! We just sped through watching Hannibal season one to be able to start watching it with season two. 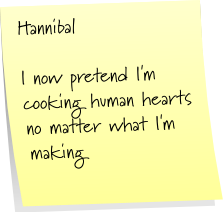 There are many cooking scenes and now I pretend to cook human too. Love seeing Gillian Anderson (swoon) no matter how brief. Now that we love the show it’ll probably get canceled. Hope you had a great Valentine’s Day or just a great Friday. Enjoy your Tuesday! Another glimpse into the ride that is jimi and kat. I’ll set the scene. We’ve just pulled into a Walgreens parking lot. I get out but the lovely wife doesn’t. I think she may have been sending a text. I decide since I’m out I’ll be a gentleman and walk around to open her door for her. Me: Jerk? I open your door to be a gentleman and I’m a jerk? Wifey: Well it was rude. Me: Being a gentleman is rude? Hello boys and girls. Gather round gather round. It’s time for another glimpse into my mind and my conversations. Yep you can learn what it is like to be as lucky as the wifebot. Enjoy. Me. Come lay with your daddy. Me. I said come and lay with your daddy. Her. I know I said it like whaat because it was creepy. Me. What you don’t like being with your daddy? Me: I’d so hit that. Me: Bill Murray says hi. Me: Yeah I met him on the set of Poop Busters. Her: Now that’s a good one. Me: Look your crush is on. Her: I don’t really have a crush on him. Me: Loook you know you want to jump his Olympic Bone. Her: What is wrong with you? I got jokes. Okay I got lots of them. For those of you that have read this place before it may be hard for you to believe I take things seriously. I do. I can be serious when needed. I’ve learned though that there are times when a laugh (or even just a chuckle) can be what is needed. I’m a passionate person. Perhaps that doesn’t always come through on this wonderfully lighthearted blog. Who knows? I’m not sure. I may even come off a bit mean here. That’s just my humor. The sharpness of the jokes is generally done with love. The jokes are turned inward at me just as much. This is not a justification of me. That is not what this post is about. If it actually sees the light of day or should it be light of blog? No if I look at what I’m trying to do with this post it’ll be easy to see. I’m avoiding the real topic of it. I’m rambling on with a description of my personality to avoid it. I can be serious (and repetitive apparently) and I can be very caring. I care about people. I love my friends and family. I like to help people. Sometimes I let humor get in the way of that but in reality that is just how I handle things. I like to see people smile. When my wife is down she makes me do this bit from Eek the cat. Being silly is how I help most of the time. Recently my oldest sister (ha ha I’m sure she loves that description) texted me with some bad news. It involved my other sister’s oldest son Michael. His dad had died. I won’t get into the how and why of it. That part really doesn’t matter. My sister (Dawn—try to keep up) has two sons. Michael’s dad and she had been long separated. To be honest he wasn’t the best of individuals. I won’t speak ill of the dead. He was not really a part of Michael’s life and hadn’t been for quite a while. It seemed like he did enough to be vaguely there but in all honesty not nearly enough. He was troubled though and I won’t put all the blame on him. After all everyone has their demons, some demons are just worse than others. This post is not about him. I’d like to say it’s about my nephew but in all seriousness it’s probably about me. I tend to do that. I knew it would be tough on him. At thirteen you are just at that point that things start to fall into place. You can grasp certain things and start to see patterns in the world. I felt sure that my sister (Dawn) would be able to handle the situation. I knew that she’d be able to be there for him and help him get through this. If anything he is lucky to have the mother he does and the great aunt. He had a support system. I should probably add for some of you that they live in Florida and I of course Cleveland. So my support would be lent from far away. I wanted to call and lend my support of course, but felt it best not to do it the day he found out. So I waited a day but when I called I got voicemail. Then when told it was a good time to call I was out. I didn’t want to make the call from a restaurant or from a friend’s place. Life kept getting in the way but I was always in contact with the family to see how he was doing. It appeared he was doing okay. Some times better than others—you know the usual when it comes to mourning. Handling it as expected. The cool thing about him is we have a lot in common. He likes sports. He is into Rock music and more so into a lot of the stuff I cut my teeth (I just like using that phrase) when I was younger. So we have plenty to talk about. Another cool thing about him is how he handles phone calls. With him it isn’t the typical feels like pulling teeth moments. He asks questions and answers questions with more than just yes or no. He tells stories and wants to hear some from you. It can be fun talking to him. When I finally got in touch with him it had been close to a week since the news. We were on our way somewhere but I felt like I wanted to contact him. I had a ton of things I wanted to talk about and bring up. In my head it would be a progression of conversation. A normal conversation and then we’ll see how the rest goes. Comfort and help as needed. I didn’t want to skirt around the tragedy but not slam it right to the forefront. If that makes sense, I guess it doesn’t. Anyway I talked to my sister for a few minutes and then he got on the phone. My mind blanked. Nephew: Hi Jimi. How are you? Me: Hey Michael. I’m good. How about you? Nephew: What are you doing today? Me: Oh nothing. Right now we’re driving. We’re going to Katie’s dad’s house. Me: Actually what we’re doing tonite is pretty fun. We are going to this art show where they created a bunch of fake movies and made movie posters and ads for them. We talked for a few minutes and I could tell the sadness of what had happened. He’s still coping with it. I mean who wouldn’t be? It was a call/conversation that isn’t typical of him. He didn’t ask many questions or tell stories. He did answer questions with real answers though. I came away from it sure he’d be okay. He was sad (duh) but there is good support and he uses music. Music my friends can soothe the soul. It can inspire and it certainly helps you understand. The main thing I took away from it was how badly I failed. I mean I was like Goose in Top Gun. I couldn’t even get out without smashing my head. This of course is horrible. I’m making it about me (and perhaps that’s why I failed?) and not about him. It is about him and I know this. I have ideas to help—especially in terms of musically. If you (all 3 of the readers who aren’t connected to the situation)have any ideas I’m open to hearing them. If I post this that is. It happened in the Alcazar. We were one of the first to arrive. Melvin sat on a couch and rose to greet us. I lied and said it was nice to meet him. His handshake wasn’t firm, but then neither was mine. He broke into the usual chit chat with Kat. I slid out of my coat and dropped it on a green chair. I reached out and shook the chair. It wasn’t something I normally did. I couldn’t tell you why I did it either. I moved it. I looked. I saw. My mind slipped down a rung. He slumped in the chair the weight of the world ready to push down on his shoulders. As he sat his gray suit bulging at his stomach more than he remembered. With a sigh he pulled his hat off and hoped this night would end soon. The door barely made a sound but he heard it open nonetheless. The hat fell to the floor a distant memory. He spun out of his chair producing a small pistol as he did. Pop. Pop. He did all this without thinking. The man hardly out of the door way crumpled. Slowly he walked over. Carefully he toed the man’s gun away. He was dead. He knew this but checked anyway. It was time to go. Gunshots aren’t the sort of things you stick around after but he needed to say it. He needed to send this man off properly and with the reverence he deserved. Straightening up he glanced out the door and then he spoke in a hushed tone. “Do you need anything young man?” he said in a shaky old lady voice. I looked up and sure enough I had wandered a little too close to the help desk. There was an older woman waiting for my answer. There was a younger man (which younger really wasn’t too hard to be) in the back office and he was staring at me. I matched their looks and then smiled. I lifted my notebook up allowing it once again to be my shield. I fixed my ninja turtle stocking cap. Raphael met them head on. They’d be no match and I held back a laugh. I watched as he jumped over the desk and planted her with a kick to the stomach and a sai to the chest. Before the young guy had a chance to move he was downed with a sai tossed into his forehead. I moved on. The lobby was warm and well lit. A couple of old ladies sat on one of the vintage looking couches. The décor was a mixture of wood pieces and thrift store chairs. The walls were a white faded brick. I circled the lobby. I walked past the couches and the bathrooms. I stopped at the rack with brochures with things to do in and around town. I searched for any sign of the man from earlier. I would take either one of the men—dead or alive—but they were gone. I fingered a community paper from last month. I hoped to find a headline that would catch his eye. I shoved the paper in his pocket but his coat was just a ghost like he was. They were watching me now. Not necessarily with the eyes of hawk’s or any suspicion but more with a confused wonder. I touched the sign that told us all visitors had to check in at the desk. To the left was a table with a pot of water for coffee and some blueberry muffins. I wondered if he was hungry. No of course not don’t be stupid. I looked to my right and there was an old work desk. Above it there were books and papers, and a puzzle box. On the desk sat a puzzle half made. I crossed the room. There was a pile of the pieces waiting to be used. He remembered begging. It was often a part of death. He kneeled next to the dead man who he didn’t know. For a brief instance he thought about looking for his wallet. He wanted to say his name to commit his name to memory, but that wouldn’t help anyone. Softly he closed the eyes of man he just killed. This wasn’t helping. He stood and whispered. Then he did the sign of the cross. He checked outside one last time and then picked up his hat. As he crossed the lobby a large black man entered the room. His voice boomed. “What is up everybody? What are all of you doing here?’ There was laughter and once again the man in the gray suit faded. However the large black man did have a name. It was Oatman or Michael. Which one depended on where you stood on the first or last name debate. He smiled and greeted everyone personally. The night was ready to begin. We sat down first in the lobby and then headed into another room. We sat around a giant conference table. Mints and water made their rounds. There was laughter. There was seriousness. Discussions were had. Ideas were floated. Everything was chummy. I sat in the background watching. Everyone was relaxed. The violence that came did so swiftly from left field. I said something. Nobody heard it. I said it a little louder this time standing up. The eyes of everyone fixed on me as I pushed forward. My target on the other side of the room and I was on him before he could react. I kicked him in his large gut. He toppled over. The rest of the group just watched. One slap. He cried out. Another slap. He mumbled and struggled. I kicked him. Hard. A third slap produced a trickle of blood from his mouth. He looked around but there was no help to be had. I kicked him some more and with a hand that didn’t feel like my own pulled out a sharp knife. He flailed and begged. His eyes locked with the group’s leader. I looked that way myself. One large black fist rose up and came back down as thumbs down. I kicked him hard one more time just for the fun of it and then slit his throat in one long quick motion. It slurped and sucked and blood sprayed up. He chocked and fell silent. I pulled back blood on my face and neck. The knife fell from my hand. I was his executioner and I didn’t even know his name. “Vaya usted con Dios.” I whispered. Just then a lady came into the conference room. She was slim and aging. Her glasses hung around her neck. She asked something. The group startled and mumbled at her. Oatman asked her for two more minutes. The play reading was about to start. The actors and playwright quickly scribbled in new additions and well one big cut. The blood of that cut was on my hands. I had spoken up. I spoke honestly and from the point of view of another playwright. The body in the corner was that of the psychiatrist and meant its actor would have 1 paragraph of dialogue at the end of the play. When I say the end of the play I mean it literally. It is on the last page. They are the last words heard. All in all it was an interesting experience. The reading was well received. I always enjoy seeing the wife do theatre stuff. There isn’t a time where she seems happier than when doing stuff like that. She is never as beautiful as when her passion flows like that. Danger Will Robinson. Danger! Wow that was sappy huh? I’m weird. This is something the wife tells me all the time. People’s eyes tell me this all the time too, but my doctor said I should stop saying stuff about talking eyes. Oh look the parenthesis are back. I don’t know why that started. I don’t know when either so don’t expect an answer or a link. Off to film The Hunt for the Brown October. I just got done shooting Pooptanic. Just got off the set of Brownaconda. Indiana Jones and the temple of Poo. Me: Yeah just finished shooting the sequel to Hunt for the Red October…Hunt for the Brown October. I don’t do this every single time and I try to mix it up and not use the same one. Carissa—which if you aren’t reading here you should be—has convinced me to create a list. I am and so thank her for that disgusting list when it happens. Anypooping back to the tmi. This happened late at night (like 2am) so there was no announcing of a shooting schedule. The wife was sweetly tucked away dreaming of sugar plum or murders. More likely she was dreaming of murders and kidnappers but that’s another story. Check one out here. So I went to the bathroom without being able to say some witty movie name. I’ll spare you the details of the actual event. I will say that there was quite a lot of it in the bowl afterwards. Now above the toilet on a rack sit her collection of duckies. You know the little rubber duckies? They have different versions. You know like punk rock duck, bad girl duck, Hitler duck,devil duck, irish duck, Jean Bonet Ramsey duck. So they’re up there. I finish my business and wipe and all that. As I finish I happen to put my hand up there. I knock poor Chicago duckie off balance and he falls. I like Spider-Man grab out for it. I catch it but the Green Goblin comes along and distracts me and Chicago duckie falls out of my hand. I almost catch it again but instead as it falls out into the air leaps the fabled Brownaconda and snags it into his jaws. Yes we apparently pee and poop into a misshapen bucket. We classy like that. It was horrible how angry it sounded as it grabbed poor poor Chicago duck. It fell pretty much directly into the poop and sunk in too. 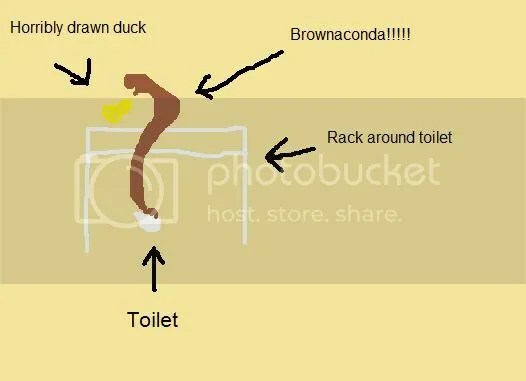 So I don’t know if it was because it was late, I was sleepy or the trauma of the brownaconda attack but I without hesitation reached right into the misshapen bucket the toilet. 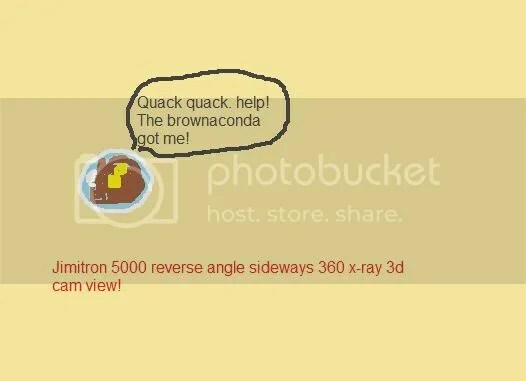 You know brownaconda and all. I grabbed Chicago duckie (sunk in a bit more as I did) and it I swear made a sort of plop-pop sounds as it pulled free. I managed to not get anything on my hand. I’m still not sure how because there was a ton in the bowl and poor Chicago duckie was covered in it. I tossed it into the shower and turned it on. After it was all gone I dried the poor fellow off and replaced him. I thought about not telling her about it but I did first thing the next morning. For 2 reasons I knew I’d use it on here and I wanted to gross her out. So I told her about the spin off to Anaconda. pieces of food sticking to her duckie.